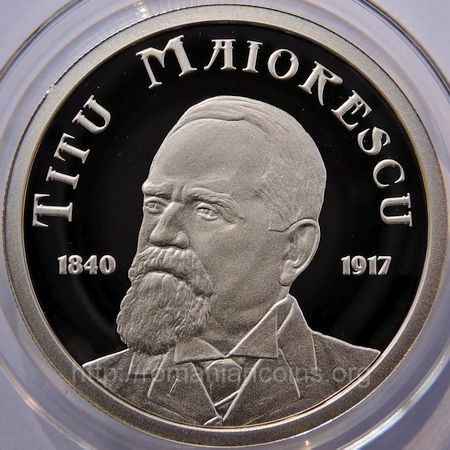 Titu Maiorescu is also featured on the 100 lei coin 2013 dedicated to the Sesquicentennial of "Junimea". 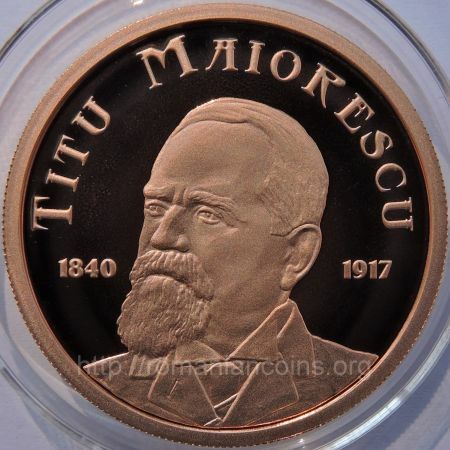 Titu Liviu Maiorescu was born at Craiova, to the family of a teacher of Transylvanian origin. This explains the name of the great Roman historian Titus Livius (59 î.e.n. - 17 e.n. ), author of the impressive Ab urbe condita (From the Founding of the City), name he received at baptism. He studied at Vienna, then law, linguistics and philosophy in Germany (in states Prussia and Hesse) and at Paris. At the age of 19 he already had a doctor's degree in philosophy. 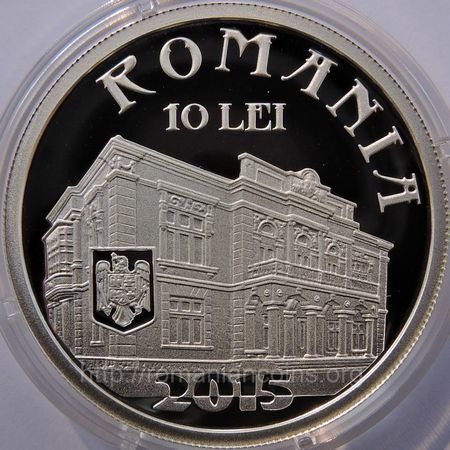 In 1861 Maiorescu returns in Romania, exercising several prestigious public offices. 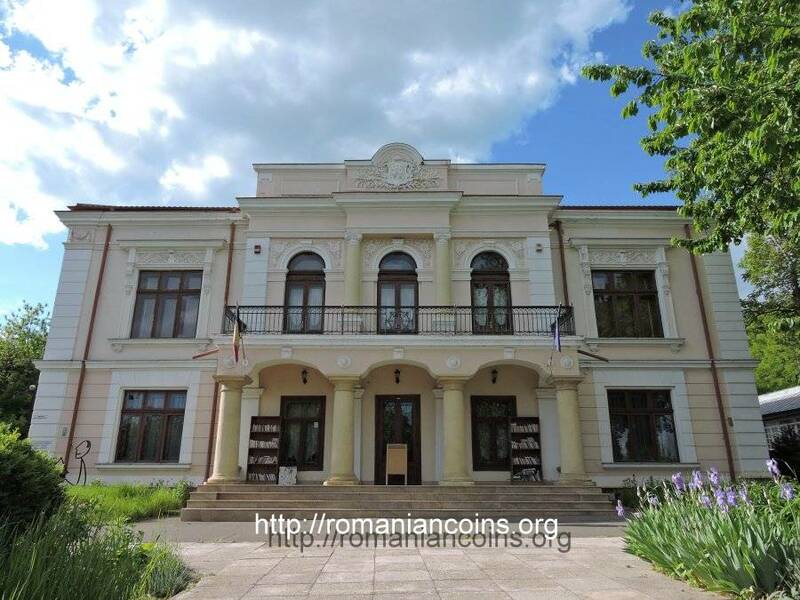 He progressed quickly, in 1863 being already the director of the National High School in Iaşi and rector of the Iaşi University (the latter having been established in 1860, at that time the only university in the state). He served also as rector of the Bucharest University between 1892 and 1897. Maiorescu was remarkable also for his acid literary critiques published in "Convorbiri literare" [Literary Conversations] magazine - the journalistic voice of Junimea. 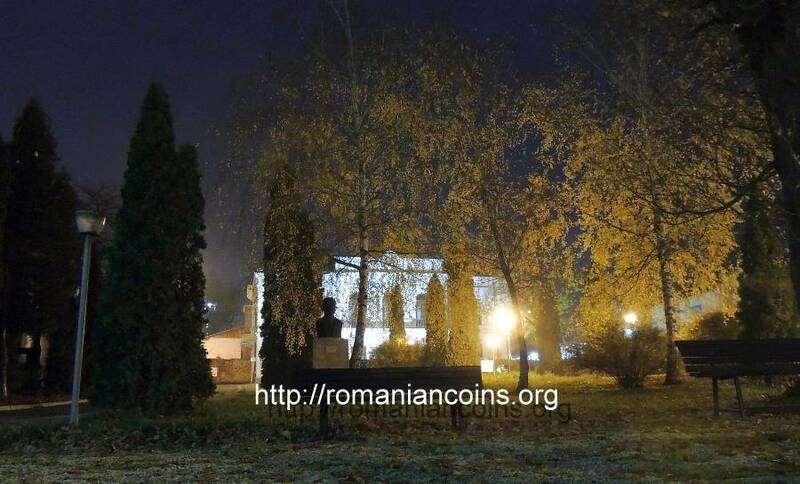 Often has he been considered a spiritus rector - spiritual guide of the Romanian culture (expression "spiritus rector" seems to originate in the German cultural space). 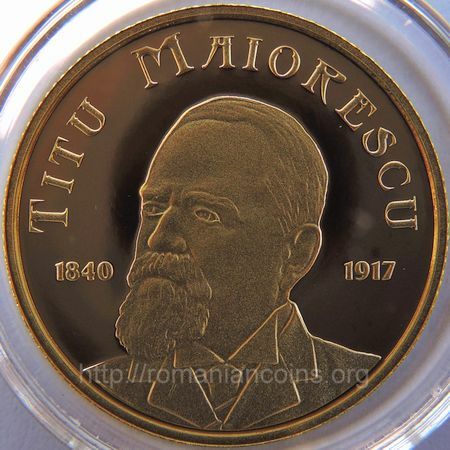 Titu Maiorescu led the Ministry of Worship and Public Instruction, Ministery of Foreign Affairs, Ministry of Justice and also the entire government, as he became in 1913 president of the Council of Ministers. 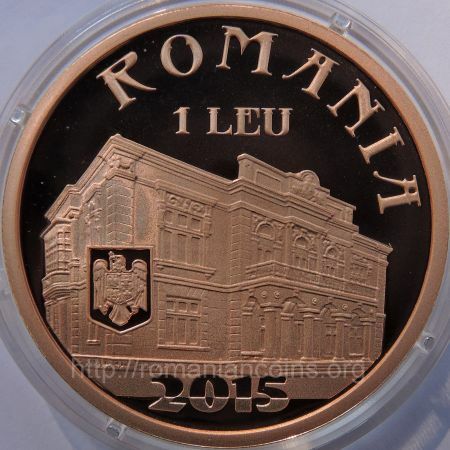 During his mandate at the head of the government, the Kingdom of Romania participated to the Second Balkan War. 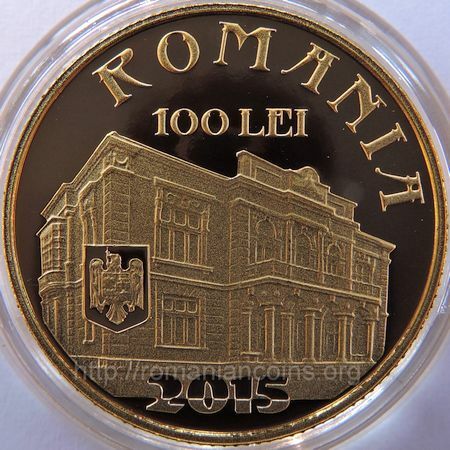 It was then that Romania acquired the city of Silistra and then afterwards the Cadrilater [Quadrilater], territories later organized as counties Durostor and Caliacra. Because of this action Titu Maiorescu was declared as imperialist by the communists, next to him the entire Junimea being harshly criticized as a reactionary society. The building known today as Casa Pogor was built in 1850 by Vasile Pogor, the father of the Junimist bearing the same name. Many of the literary society Junimea's assemblies took place in the saloon of Casa Pogor. 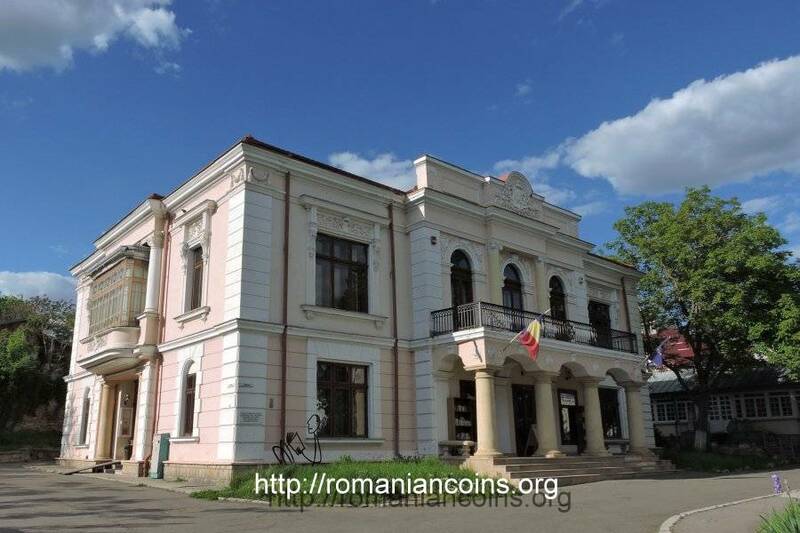 During 1944 and 1945 the building was used by the Soviet occupation troops and then it housed various institutions. 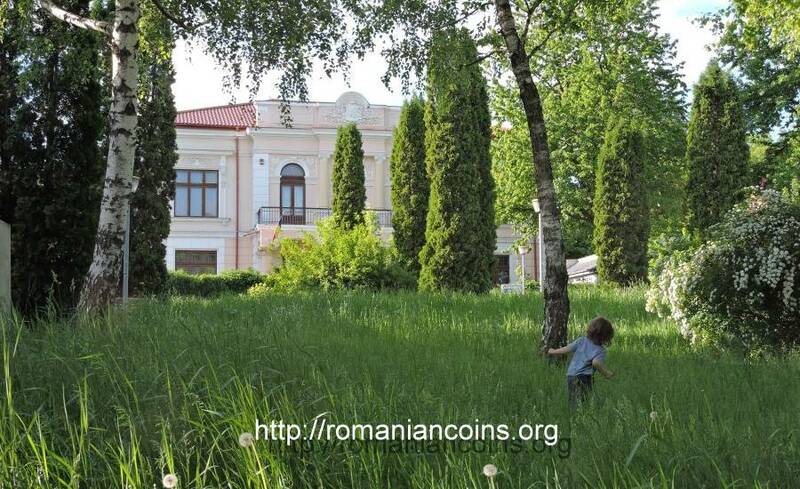 During communism, the yard of the Pogor House had to take in a cemetary for the Soviet soldiers, which was moved in 1992 at Eternitatea Cemetary in Iaşi. 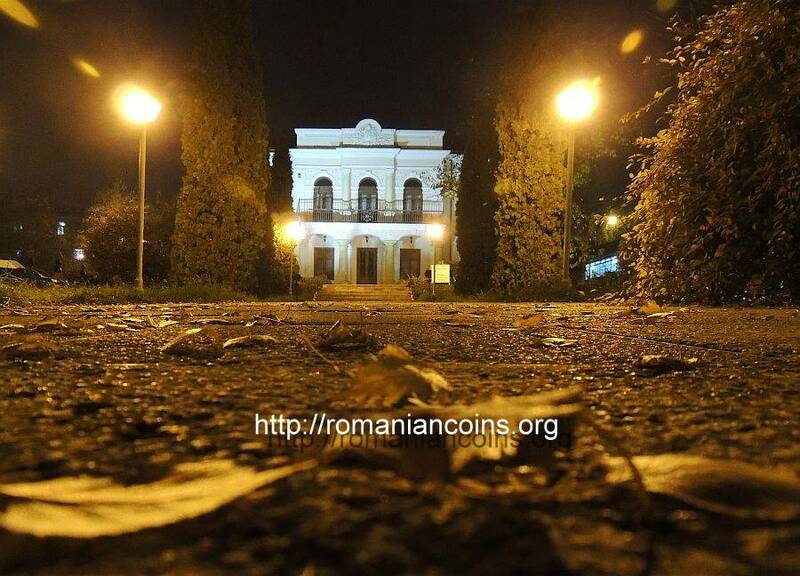 Since 1972 here functions the Vasile Pogor Museum (as section of the Romanian Literature Museum in Iaşi). The building itself was restored in the period of 1994-2006.